I'll ne'er forget that happy night, Amang the rigs wi' Annie." Lammas, or "Loaf Mass," is the Feast of the First Harvest, the Feast of Bread. This Holy Day honors the women who created agriculture and bred the crops we cultivate, especially the grains, or corn. In the British Isles, celebrants make corn dollies from the last of the newly-harvested wheat. The corn dolly holds the energy of the grain Goddess and, when placed above the door or the mantle, will bring good luck to the household all year. When we think of corn, we think of succulent cobs of crisp, sweet, buttery yellow or white kernels: immature Zea mays, Indian corn. You know, corn. As in sweet corn, popcorn, blue corn, decorative corn, corn bread and corn chowder. Corn! But, did you ever wonder why it's corn? "Korn" is an old Greek word for "grain." Wheat and oats, barley and even rice, are korn. This usage is preserved in the song "John Barleycorn must die." When Europeans crossed the Atlantic and were introduced to the beautiful grain the Native Americans grew, they, of course, called it "corn." And nowadays we think of corn as only that, but corn is Kore (pronounced "core-a"), the Great Mother of us all. Her name, in its many forms -- Ker, Car, Q're, Kher, Kirn, Kern, Ceres, Core, Kore, Kaur, Kauri, Kali -- is the oldest of all Goddess names. From it we derive the English words corn, kernel, carnal, core, and cardiac. "Kern" is Ancient Greek for "sacred womb-vase in which grain is reborn." The Goddess of Grain is the mother of civilization, of cultivation, of endless fertility and fecundity. To the Romans she was Ceres, whose name becomes "cereal." To the Greeks, she was Kore, the daughter, and Demeter (de/dea/goddess, meter/mater/mother) as well. To the peoples of the Americas, she is Corn Mother, she-who-gave-herself-that-the-People-may-live. She is one of the three sister crops: corn, beans and squash. In the British Isles she was celebrated almost to the present day as "Cerealia, the source of all food." Honoring grain as the staff of our life dates at least as far back as Ancient Greece. Nearly four thousand years ago, the Eleusinian mysteries, which were regarded as ancient mysteries even then, centered on the sacred corn and the story of Demeter and her daughter Kore or Persephone. Initiates, after many days of ceremony, were at last shown the great mystery: an ear of Korn. Korn dies and is reborn, traditionally after being buried for three days. Corn and grain are magic. The one becomes many. That which dies is reborn. Many Native American stories repeat this theme of death and rebirth, but with a special twist. 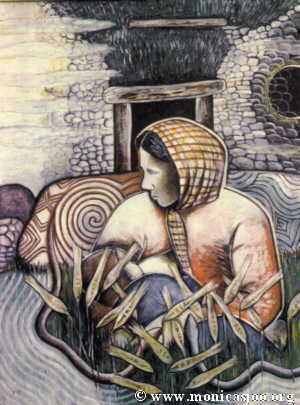 In some origin of corn stories a woman is brutally murdered, in others she demands to be killed. No matter. Once she is dead, she is cut into pieces and planted. From her dismembered body, corn grows. Again and again, everywhere around the world, the story of grain is the story of humanity. The sacred symbolism of grain speaks loudly to the human psyche. 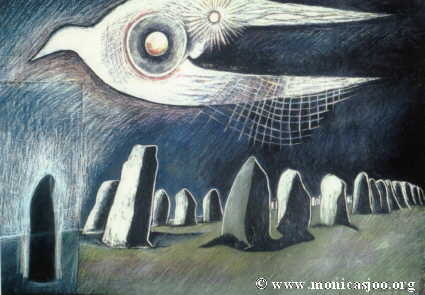 To the Ancients, the light in our lights is the Kore, the core, the soul, the seed, of each being. Real, whole grains sustain us. Real, whole grains are sacred. Real, whole grains reconnect us with our human lineage. When we eat them, we feel satisfied in a deep and fundamental way. When we eat them, we ground ourselves, we nourish ourselves in multiple ways. But bleached and enriched grains do not sustain life, nor are they inherently sacred. Grains that have had the bran and the germ stripped away do last longer, but have little to offer us physically or spiritually. When we eat them, we feel empty. Thus, many of us have come to equate bad news weight gain with carbohydrates, specifically, grains. Grains are the Goddess who sacrificed for us; they aren't to blame. It's the processing that does us in. August is a good time to make peace with the Corn Mother. Switch to organic corn chips; some supermarkets carry them. Try out whole wheat pasta; my simple recipe below makes the best lasagna you ever ate; you won't believe it's whole wheat. Explore millet, kasha, quinoa, teff, kamut, spelt, wild rice, brown basmati, and my dietary mainstay: Lundberg organic short-grain brown rice. Cheer Ceres. Throw your own whole-grain Carnaval! Grains are medicine, too. Corn silk is an important remedy to help bladder woes. A handful of rice or barley boiled in several quarts of water is a folk remedy for anyone who lacks appetite or who has digestive woes. We're all familiar with the heart-healthy effects of eating oats. And oat straw infusion, made from the grass of the oat plant, is considered a longevity tonic in India. Celebrate the Corn Mother any way you can. Invite Her into your life as food, as medicine, as decoration. And don't be surprised if you feel happier and healthier than ever before. The green blessings of the grains are special blessings indeed. You are an amazing woman. I am an herbalist and have read all your work. I just wanted to ask you when did you begin your herbalist path? I know with time you learn and grow and have more and more knowledge. You seem to be so advanced in this path and that is something I strive to be. Please give me your words of wisdom on this matter. These one-day workshops (10AM-5PM) are taught outside among the plants, with Susun and the goats. Open to men and women, they include a wild-food lunch. 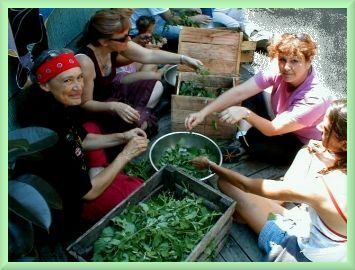 At each workshop we will identify, harvest, and use local plants for food and medicine. Registration Fee: $75. Women can join us for a moon lodge on the Friday of each of these weekends. Overnight lodging for Friday and Saturday nights is available nearby. 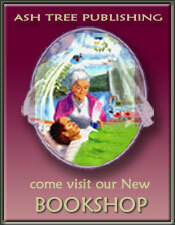 Follow the path to physical and spiritual health with this how-to manual filled with ancient lore and wisdom. Using stories, songs, rituals, recipes, meditations, and trance journeys, it suggests more than 100 ways to practice the art of magical healing. Find out how to reconnect with the earth and draw on its energy, interact with the power of the seven chakras, make use of moon magic and women's wisdom, prepare herbal infusions and baths, work with the medicine wheel, and cast spells for love and wealth. No matter what your beliefs, this guidebook will open your heart and mind to the joys of everyday life. "Robin has been practicing Earth Spirit healing, herbalism and Wise Woman ways for twenty years and is an incredibly gifted spiritual teacher, healer and ceremonialist. Robin's powerful teachings come to the reader through a personal writing style that is immediately engaging, sharing practical wisdom through anecdote and example."